Simple and easy to use design, ideal for desktop placement. 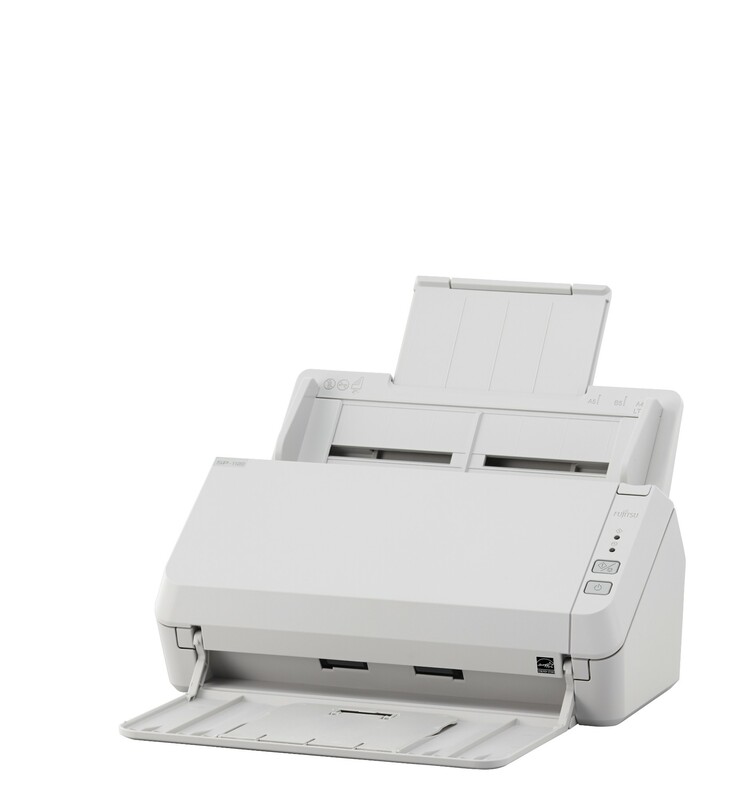 Evolve from your physical to electronic documents with digital ease with the SP-1120. Create one single source reference for all your data by merging these with your digitally born documents. Gain the business advantages of working with more convenient, flexible and secure digital images using simple push button routines, the SP-1120 feature a simple operation panel with only 2 buttons (Scan / Stop and Power) as well as software enabled push button management. Store, retrieve and manage your documents more productively, efficiently and cost effectively than paper records allow. At the same time actively embrace compliance risk avoidance concerns and increase your customer’s satisfaction. pre scan sorting thereby helping to save the inconvenience of fine tuning the document for the OCR process. 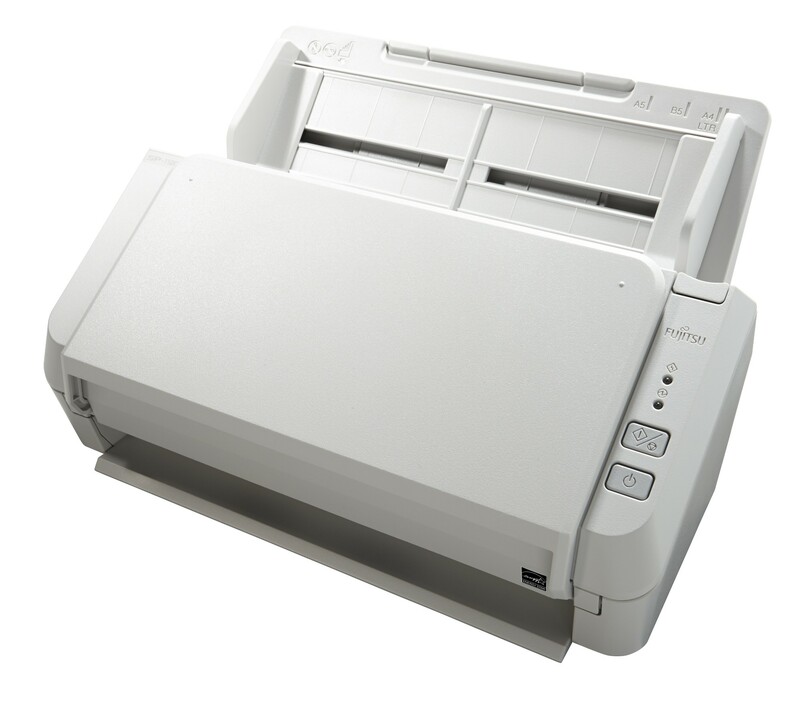 Fujitsu scanners are renowned for their highly reliable paper handling capabilities and these help remove image capture disruptions to reduce document management overheads. Measuring only 298 x 135 x 133 mm (W x D x H), the compact design of the SP-1120 model takes up minimal space on a busy desktop. The small footprint means these devices are always available and within reach for uninterrupted performance. Trade a small desktop space to reclaim a much larger space taken up by paper records. searchable and editable files from your paper documents allowing you to retrieve information more efficiently at a future date (the OCR processing can handle 190 languages). Presto PageManager offers further possibilities for the enhancement, conversion, collaboration and organisation of your files. Whether dealing with healthcare, legal, financial or other documents that need to comply with long term storage regulations the SP-1120 helps support the efficient on-ramp into your archives. The SP-1120 model through their 50-sheet automatic document feeder (ADF) can process single or double sided pages at the same time. 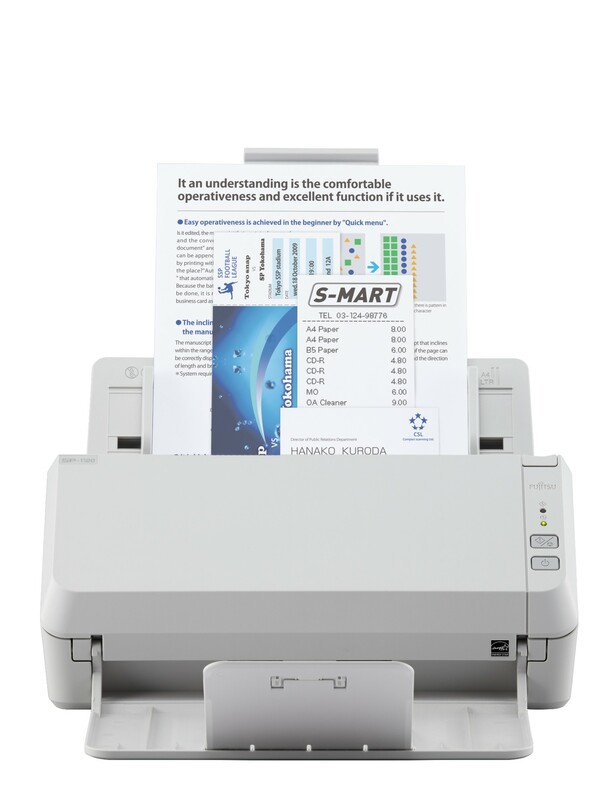 The SP-1120 can scan 20 A4 single sided pages per minute (ppm) or 40 images per minute (ipm). 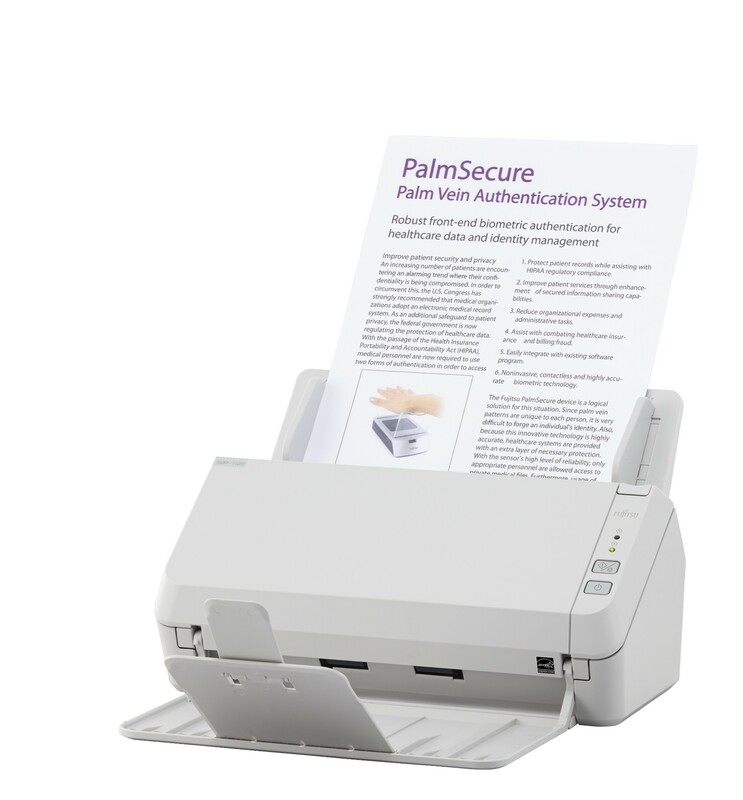 PaperStream IP is the scanner driver for the SP-1120. In addition to being fully compliant with the industry standard TWAIN and ISIS interface, PaperStream IP incorporates as standard, highly sophisticated image processing that automatically applies features such as noise removal, background pattern removal and character augmentation to produce exceptionally clear, high quality images that are suitable for direct import into the users’ workflow. PaperStream IP has an intuitive, easy to use interface that can be switched between Administrator or User mode to simplify the scanning process and reduce user error. Additionally PaperStream IP also introduces a new Assisted Scanning mode, which allows the user to visually select the best quality image from a range of images of the page, rather than needing to manually fine tune the scanning parameters one by one. PaperStream Capture Lite is a powerful application used to scan documents with the SP-1120. It is extremely easy-to-use and provides an interface similar to a mobile application that allows users with little scanning experience to use the scanner almost instantly. PaperStream Capture Lite is based on the “One Click Capture” concept, which promotes reducing the number of times to touch the screen. It is effective in the prevention of operational errors as well as streamlining repeated operations. PaperStream Capture Lite presents itself as an essential capture tool for feeding TIF, BMP or JPEG files into defined capture routines by simply selecting a pictogram presented on screen. The software can be downloaded from the website designated in the Setup DVD-ROM.